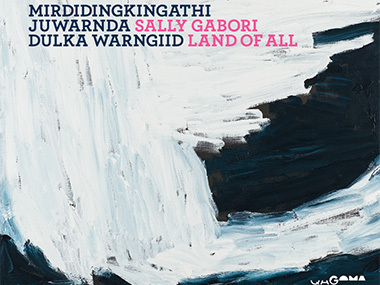 To celebrate the significant contribution to art of the late Kaiadilt woman, Mirdidingkingathi Juwarnda Sally Gabori (Mrs Gabori), the Queensland Art Gallery | Gallery of Modern Art (QAGOMA) will stage a major retrospective of her work to open 21 May 2016 called, Dulka Warngiid – Land of All. In development before the artist’s death (in 2015), the exhibition takes its name from the Kayardild language name for Bentinck Island, which translates as ‘the whole world’, ‘the land of all’ or ‘the one place’ to reflect the body of work she created. Born in the 1920s, Sally Gabori lived a traditional life with her family on the sparsely populated Bentinck Island until the entire population was moved to Mornington Island by Presbyterian missionaries who disapproved of the men taking multiple wives - as Pat Gabori did - and took advantage of a cyclone and a devastating drought that followed to effect their removal. While in exile on Mornington Island, Gabori kept her traditions alive, continuing to speak her language and sing the songs that connected her to her home, though none of her children learnt the highly complex Kayardild language. So it was painting which was Gabori's only way of passing her island's stories on. Encouraged by Mornington Island Arts when she was aged 81, Gabori created works which were shown simultaneously at Brisbane’s Woolloongabba Gallery and entered into the QAGOMA’s first Xstrata Emerging Indigenous Artist Award - which she didn’t win - but it was her love of paint and painting that provided a new focus for her in the final decade of her life, so much so that in that period she created more than 2000 artworks. “Gabori’s keen desire to communicate the stories and knowledge accumulated over an incredible life spanning 90 years has left an astonishing legacy," says Bruce McLean, QAGOMA’s Curator of Indigenous Art. 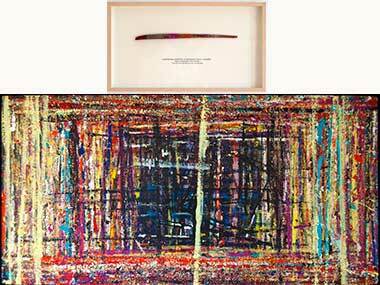 "Although many of her paintings appear abstract, they retain an essence of Kaiadilt Country, and at their heart they resonate with universal themes of loss, longing and love. It was to these places that the Bentinck Islanders were able to afford to return to for the first time with the income generated from painting. Dulka Warngiid – Land of All will bring together many important works - including her first and last paintings, large-scale collaborative works produced alongside other senior Kaiadilt women, bark paintings made in conversation with Yolngu artist Nyapanyapa Yunupingu, and works on paper created toward the end of her career - from QAGOMA’s collection such as Dibirdibi Country – Topway 2006, Dibirdibi Country 2008 and 2012, as well as works drawn from private and public collections nationally, including Sally Gabori’s painting table and brush from the Collection of Beverly and Anthony Knight. 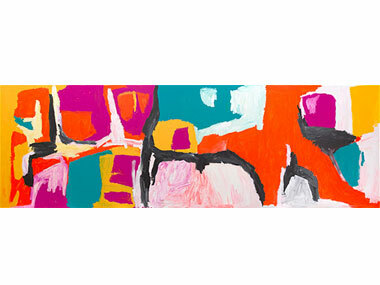 It is an exhibition which, “Captures in depth Sally Gabori’s instinct for colour and composition, her epic and multi-layered painterly abstractions that resonate with her deep connection to story places on Bentinck Island,” says QAGOMA Director, Chris Saines. From 25 June visitors to the exhibition at QAGOMA can also experience The Gabori Sisters: Gathering by the Sea - a free, large-scale interactive project at GOMA's Children’s Art Centre, which has been developed in collaboration with Gabori’s three daughters Dorothy, Elsie and Amanda Gabori. Dulka Warngiid – Land of All is accompanied by a major, full-colour publication featuring essays by exhibition curator Bruce McLean and Judith Ryan, Senior Curator of Indigenous Art, National Gallery of Victoria. The exhibition will travel to the National Gallery of Victoria from 23 September 2016 until 31 January 2017. Join Bruce McLean, Curator, Indigenous Australian Art, QAGOMA in conversation with Judith Ryan, Senior Curator of Indigenous Art, National Gallery of Victoria and Professor Paul Memmott, Director of the Aboriginal Environments Research Centre, The University of Queensland, as they discuss the life and work of Sally Gabori, and reflect on the significance of her practice on contemporary Australian art.